It’s safe to say I will try anything when it comes to new theatrical experiences. I’ve always loved Lincoln Square’s IMAX screenings, I’ve seen entire Broadway plays done in binaural audio (that’s “3D” sound) and even shelled out extra ticket money to see a favorite film in 4DX once or twice. So I was excited to try out Positron’s Voyager Chair, a VR experience which is being deployed to several theater celebrating the release of Universal’s First Man. Guests heading out to several AMC locations across the nation have not only the chance to just see the Damian Chazelle film, which is released on October 12th, but to take a small excursion to the moon themselves. I got to try out the Voyager chair on Tuesday both with the First Man VR experience as well as a seasonally-appropriate horror short called “Night Night” and was really impressed with the level of immersion, from the spatial audio to truly being able to look in all directions within my headset. My First Man mission even had an animated co-pilot! Best of all, the Voyager chair itself, whose design looks straight out of Men In Black, was actually pretty comfortable and even after these two shorts I felt no sort of motion sickness, which I was wary of considering 3D films can give me a headache. Positron’s CEO Jeffrey Travis was in New York this week with the Voyager to talk about the potential that this technology presents to cinematic VR experiences. Lauren Damon: Was this pod created just for First Man? Jeffrey Travis: No, we created this to be a platform for cinematic VR in general. So the first kind of wider public experience was we did The Mummy with Universal. So we’ve done three experiences with Universal–The Mummy, Jurassic World and First Man. It was all really cool. But there’s a lot of other studios and places that we use these with. The idea is to create ultimately VR cinemas. LD: Is the goal here to get whole theaters of these? JT: Yeah! So we can do theaters with this. Mini ones of twos or threes and we actually set that up here at Pod hotels here in Brooklyn. It’s open to the public. 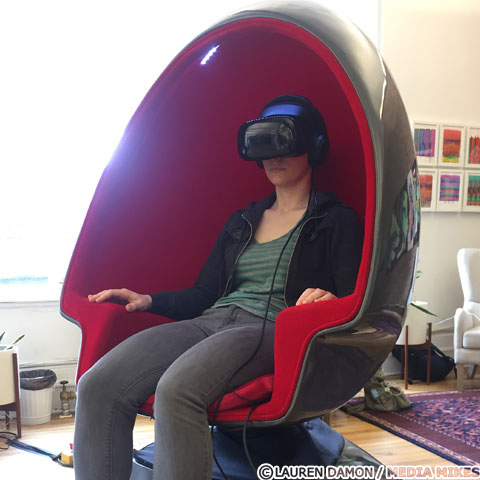 We have pairs of chairs at AMC theaters here in New York at Lincoln Square, San Francisco, DC, LA, but eventually we’re going to be putting this in permanent installations and creating VR theaters of 30-40 chairs and people could buy a ticket and come for an experience that’s either like something of what you’ve just experienced or longer. Somewhere from a half hour to an hour. LD: Yeah because how long can you view it without feeling it too much? JT: Yeah we talk about that. I think the ideal length is about half an hour for cinematic VR. I think longer than that, the headsets can get a little heavy on some people. But those are being made by companies like Facebook and Samsung and Microsoft and HP and they’re getting better all the time. So I think we will be able to have 90 minute VR experiences. But right now a half hour feels like a very full meal. LD: What would the price point be in terms of ticketing? JT: So probably around—it depends on experience—but probably averaging around $30. LD: That price is actually similar to they have those “4D[x]” theaters here, what are your thoughts on those? JT: We do get asked about that. I think it’s still fundamentally different. You know, to me the 4D movie theater, you’re adding some sensory effects that compliment the 2D screen experience. Which is fine and good, but what we’re trying to do here is really bring VR to where you forget about the screen, you even forget about the motion…So it’s almost like you don’t notice it’s happening. You should just feel like you’re actually in the story. That’s kind of the goal, not just a little enhancement but something that’s integrated. LD: How much testing goes into something like this? How much time does it take to produce? JT: It really depends on the piece but it goes through a lot of testing. Several months. This next piece that we’re working on is called “Shady Friend,” a VR comedy starring Weird Al Yankovic. It’s a psychedelic comedy that uses scent as well and it’s about a guy that accidentally takes this latest designer drug and goes on this crazy LSD trip. So we’re using motion, haptics and scent and it’s in post-production right now, we shot in July, and it will probably be ready by January. About six months. LD: When did you start working on this particular First Man experience? JT: First Man, so that was produced by Ryot and CreateVR and they started actually just two months ago. It was a very accelerated schedule. Which is a little more unusual. LD: Was all that footage created for this VR? JT: So obviously the stuff you’re seeing in Mission Control and on the screens is from the film, but then everything else for the VR experience had to be created from scratch. The films assets are mostly 2D and we needed to create these 3D volumetric environments like the moon. LD: Are you going to get Ryan Gosling to try this out? JT: I hope so! We had them at the premiere of First Man in the space there. So he was there, I didn’t get a word whether he did it or not. I know the producers of First Man got in there. LD: There’s definitely a push to add more to theaters considering how much is available for home streaming, do you see this as adding to that? JT: That’s the idea. I think that movies are certainly in the US and North America, struggling with people going to the box office because they’d often rather stay at home and stream on Netflix. So I think part if the appeal for this is that hey, this is an experience you really can’t get at home. At least not yet. And this brings people out to the movies or at least out to our locations and experiences. LD: What other films will be having similar tie-in experiences like this? JT: I mean there’s some coming we can’t really talk about, because they’re not really announced yet. But we’re working working with several other studios besides Universal on some titles and we’ll be announcing as we can. Megyn Price is best known for her TV roles like Claudia Finnerty on “Grounded for Life” and currently Audrey Bingham on “Rules of Engagement”. “Rules of Engagement” is gearing up to end its seventh season and hit 100 episodes. Megyn is getting a chance to set behind the director’s chair this season to direct her first episode, “Timmy Quits”, which airs on April 29th. Media Mikes had a chance to chat with Megyn about the episode and what we can expect. Mike Gencarelli: Let’s talk about the episode “Timmy Quits”, what made you step behind the director’s chair? Megyn Price: It was something I have wanted to do for several years now. It started looking into it a few years ago to see if it would be possible with our show. The thing is with acting, you can get a little tiny acting job to start out. But there are NO tiny directing jobs [laughs]. It is the big kahuna or nada! So I was backed by CBS, Sony, my bosses and it was fantastic that I got this episode to direct. Not many people get their first directing gig on a prime-time sitcom on a major network. It was huge. MG: What was your biggest challenge directing and starring in the episode? MP: I had done a ton of homework on the directing side. I had shadowed a lot of different TV comedy directors. I had seen a lot of different styles and I felt like I needed to learn how to do it. After working on over 200 episodes of television throughout my career in front of the camera, it is just so comfortable to me, like being on a bicycle. It makes total sense in my brain since I have lived on a TV set for 20 years of my life. That part of it, I kept waiting to feel nervous about the directing but it didn’t happen. I never felt nervous or out of control. The thing that was very challenging though was not being a crappy actor, when I was directing. That was not the problem that I expected. I can act with one eye open and two hours of sleep [laughs]. I found myself thinking about the set and the way it was being shot and that the opposite way to think to be a good actress. You need to just stay in moment when you are acting. So when I was in my director’s head and then trying to rehearse as an actor, I was the worst [laughs]. So I talked with one of my friends, who is a director, and he gave me this tip to make up some move or sentence that clicks your brain over back to acting mode before you step onto the set. When we were getting ready to shoot, I put our hand on our assistant director’s shoulder and I said “Ok Carlos, you are calling action and cut”. Just saying that to him made it easy for me just to focus on acting. I didn’t want to ruin the one episode I was directing by with crappy acting [laughs]. MG: No pranks or hijacks from the cast and crew? MP: You know what, they were all so sweet. I think they thought that I was nervous, so they were all really nice to me. I showed up the first day with a riding crop and acted all bossy on purpose [laughs]. So they thought that was funny. MG: How did it come about for you to direct this specific episode this season? MP: It is always the producers who chooses. I felt very fortunate though. A lot of the episodes of “Rules” are just about being funny. This was a script has something actually real happens in it. This was a little scary for me having to go serious there for a minute, then pop back to being funny. It was really interesting for me since I am much more interested in doing comedy that has reality in it. You want to care about these characters each week. So I felt really lucky that I got one of the scripts that really has some sincerity in it along with being very funny and well written. It was very interesting experience…which is such a boring word but it was! I was so excited getting up and going to work every day. MG: Any plans to direct more in other projects as well? MP: Absolutely! Hopefully someone will let me [laughs]. This experience has really lit this fire for me. I felt like a million bucks and felt very creative again doing this. I have been on a couple of shows that have gone on for many years and it is almost impossible not to get a little complacent in your job over that time. You have this steady job for seven years and are doing the same thing over and over. So doing this took me out of that comfortable position and made me inspired. I swear to God, I started writing again. It just woke me up. I wrote a TV project and I am in the middle of writing a feature. So it really energized me in my career and I have felt since. Also I feel like having lit this fire right when the series was ending was so beneficial for me with what is happening next, which I have no clue what that may be. MG: After seven seasons, what is your secret for keeping straight against Patrick Warburton? MP: I don’t know. We have such a great relationship outside of work. He and I both love that couple so much and we love their fights. We don’t laugh because we are so in love with what we are saying. The interactions between them are just great. Sometimes I also do laugh at him on-screen though, which is something I had to fight for. My point is that when your husband is being funny you can laugh at him! I laugh at my real husband when he is being an idiot during fights. Actually we can’t even have fights since we just start laughing at each other. So it makes it a little more real. MG: How was it shooting the 100th episode of the series? MP: If everyone looks like them have been crying…that is because they had been [laughs]. It was a little rough, since as a cast and human beings we have gone through a lot in seven years. Most of it all was great. There have been babies being born, marriages, divorces, and more marriages. There has been a lot of life that has happened in seven years. So as a cast, we became incredibly close on a deep level. Oliver (Hudson) and I had our first kids within a month of each other. I remember I was holding my one month old baby and his wife was in my dressing room asking me how she would know if she was in labor [laughs]. When you go through stuff like that with your friends it changes you. So we were looking back on the past seven years and it was hard.